Courtship and Matrimony, drawings by C Sheppard. Courtship and Matrimony by C Sheppard. 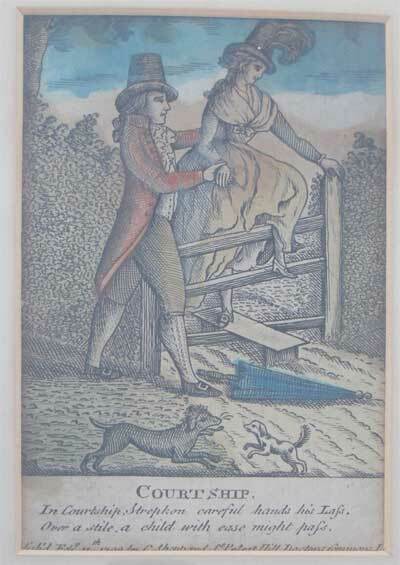 In Courtship, Strephon careful hands his Lass, Over a style, a child with ease might pass. But Wedded Strephon now neglects his Dame. Tumble or not, to him 'til all the same. C Sheppard is believed to have been a copperplate printer and publisher at No. 15 St Peters Hill, Doctors Commons, London in 1792. I have found this link where a pair similar to the above were sold for £26 in 15 Feb 2008. 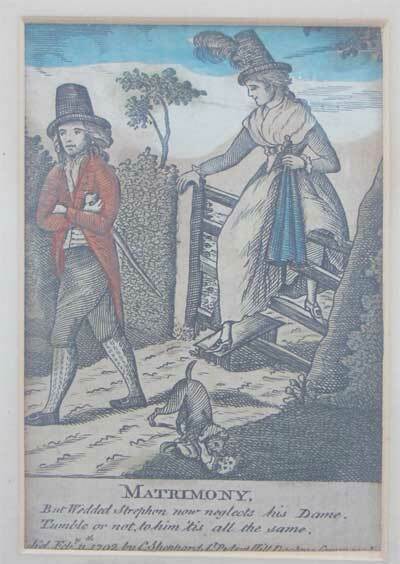 There exist at least pictures and details for six similar copperplate etchings by the same artist: The verses relate to the misadventures of Clarissa who was led astray by a young man!. If you have a web site you are welcome to put in a link on your site pointed to this page.